The city police today claimed to have cracked the blind murder of a 75-year-old NRI, Kulwant Singh Grewal, with the arrest of his 62-year-old millionaire younger brother Jaswant Singh Grewal in this connection today. "Aim high, put in your best efforts and spend quality time and you are bound to achieve your goal". The officials and field staff of the building branch of the Municipal Corporation were today told to keep a close watch on unlawful constructions in the city, especially the construction of commercial buildings carried out without approved building plans or under the garb of residential buildings. 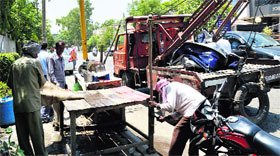 Continuing with their anti-encroachment drive to clear the obstructions in the way of smooth flow of traffic in the busy commercial hubs in the city, a team of the officials and staff of the Tehbazari wing of the Municipal Corporation today removed furniture, rehris, merchandise and other items from various parts of the city. A 14-year-old girl died today under mysterious circumstances, while her 19-year-old sister was struggling for life at Guru Teg Bahadur Hospital here. The deceased has been identified as Bharti. Constable Kulwant Singh, who is posted here, truly loves his wife. He encouraged his wife Jagdev Kaur to fulfil her dream of studying further at a time when most women could hardly take out time from household chores. Judicial Magistrate, Jagmilap Singh Khushdil, has convicted Mandip Singh, a resident of Street No. 3, Shimlapuri, Ludhiana, in a cheque (Rs 1,70,000) bounce case. The Punjab Government has chalked out Rs 70 crore comprehensive plan for the development of Payal Constituency in Ludhiana District. This was disclosed by Speaker of Punjab Vidhan Sabha, Charanjit Singh Atwal, while presiding over a review meeting held here regarding the overall development of Payal Constituency. The local police swung into action after yesterday’s firing in the office of RD Puri, vice-president, Shiv Sena, (Bal Thakare) and subsequent rioting by his supporters in Kashmir Nagar and surrounding areas. The police launched a massive probe to nab the suspect who was behind the shooting incident. The results of the government schools have shown an improvement as a result of extra effort put up by the teachers, parents and also because of regular checking in the schools. The students have done well both in class X as well as XII. 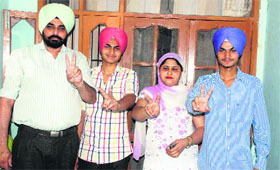 Ludhiana: The girls of Khalsa College for Women here, bagged the top two positions in the university merit list for BBA II, said the principal, Dr Varinder Kaur Thind. Ludhiana: The admission process has been started to fill up the 50 seats of Diploma in Veterinary Science and Animal Health Technology at Guru Angad Dev Veterinary and Animal Sciences University (GADVASU). CII Ludhiana Zonal Council organised an interactive session with MS Mann, District Town Planner, Ludhiana, to discuss issues related to the Change of Land Use (CLU) and External Development Charges (EDC). Cooling off: To beat the heat, emu birds have a splash in a small pond. Tribune photo: Himanshu Mahajan. Railway employees are irked with the cancellation of medical facility which the railways used to provide to all the employees on other stations. Income Tax department is in gear up mood and is scanning salary slips of the top executives of corporate houses and public sector undertaking for examining the Tax Deduction at Source (TDS). Three persons, including two women, allegedly thrashed a woman who was pregnant. The victim later suffered a miscarriage. 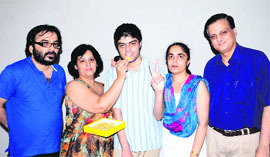 The accused have been identified as Ravi and his wife, Veenu, and Raji, all residents of Amarjit Colony. The Jagraon police has arrested an alleged proclaimed offender, wanted to the police in a drug peddling case for last three years. The accused has been identified as Jasvir Singh, alias Seera, a resident of Sidhwan Kalan village near Jagraon. District Amateur Athletic Association, Ludhiana, seems keen to promote the athletics in the district. To uplift the athletics and encourage the athletes for better performance, the District Amateur Athletic Association, Ludhiana, has decided to honour the state and national winners with cash prize, in first of its kind initiative.